Advertising is the most important tool for the promotion and growth of any business. If you are planning to advertise in Telugu newspaper then Sakshi is one of the best daily newspaper. This is one of the leading Telugu news daily founded in the year 2008.Now a days there are many ad agencies in the market which help you book newspaper ads online. One of the most popular and highly reliable online newspaper ad booking agency is Book4ad. 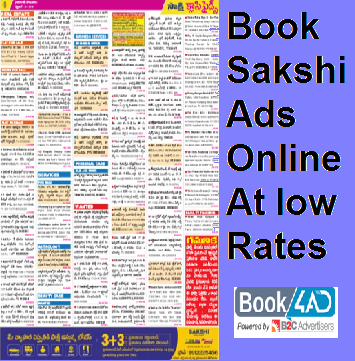 Sakshi classified advertisement booking made easy through book4ad. You can choose Sakshi newspaper to book classified ads of different categories. It is the second largest circulating newspaper in Andhra Pradesh & Telangana with more than 14,00,000 copies. You can book Sakshi classified ads online for the following categories such as book property for rent classified ads, book property for sale classified ads,book education classified ads, book Astrology classified ads, book entertainment classified ads,book matrimonial classified ads,book recruitment classified ads,book business classified ads,book services classified ads,book vehicles classified ads,book public Notice/Tenders classified ads,book personal announcements classified ads,book name change classified ads,book retail/shopping classified ads, book travel classified ads,book remembrance classified ads,book computers classified ads,book marriage bureau classified ads,book Health and Fitness classified ads etc. We are an online ad booking agency which helps you book ads in all the leading publications all over India with exciting offers. 1.Choose the ad type classified Ads,Display Ads and Classified display according to your requirement. 2.Select the type of ad you want to book,draft your ad using ad samples provided. 3. After you draft your ad select the city in which you wish to publish. 4.Check the available offers and schedule your ad by selecting the date. 5.After verifying all the details you can pay through our secured payment gateways. After your payments are done an auto generated invoice is generated and sent to your mail id. You can have a preview of the ad before it gets published,this lets you perform any changes in the matter before hand. You can check the status of your order in “My Accounts” in the www.book4ad.com site. You can chat or call us at :9030119494. Book4ad.com is a reliable platform which helps prosper your advertisement.